You commonly hear an equity firm or VC partner claim, we invest in the people and when it comes to costs, human capital usually represents nearly 70% of all operating costs. Their decision to invest becomes a decision to assume the correct amount of risk for the projected payoff. However, the overwhelming valuations of risk are deeply flawed. The gamble, or risk is not on market or legal risk, but really a the risk of a team to deliver something within a certain time and within a certain budget. In other words the investment is in a project. Critically flawed ventures have at least one criterion concerning the personality or experience of the leader and the team. 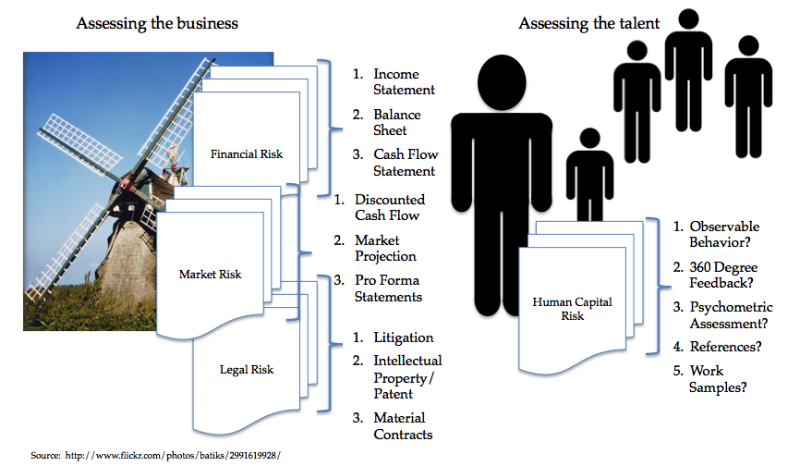 In many evaluations there is a disproportionately low due diligence around human capital risk compared to financial, market, and legal due diligence. Too often the human capital due diligence focuses on industry experience, work history, and academic education, which has little positive correlation to successful ventures. If management proved unable to cope with market place change, the two issues directly relate. That is human capital. 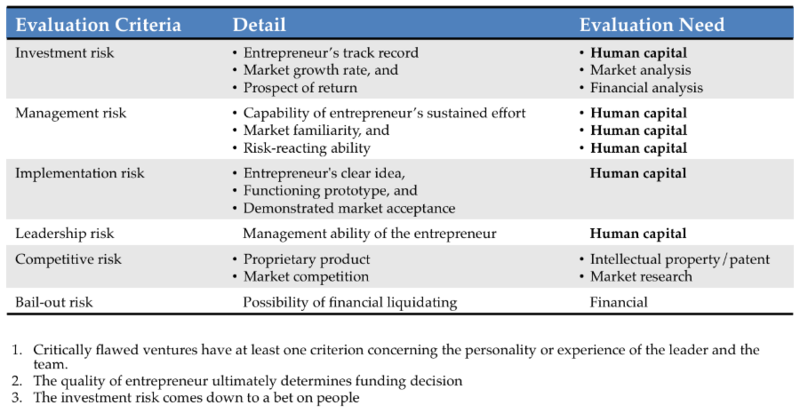 Valuation models have as much intangible as tangible, however just as financial projections intend to reflect underlying or expected enterprise value it is pretty common knowledge market projections and discounted cash flow are projections of future fuzziness. There is a disproportionate comfort level in financial or market projects that are deeply flawed, if not a greater leap of faith, than any human capital assessment. Where and how is human capital usually projected? Observations or documents, reports, stories, and conversations. None of these are quantifiable, none of these are relatable, and many of these are subjective, at best. 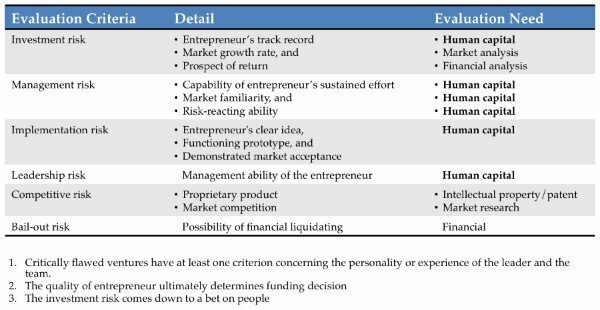 These are not human capital assessments and like the financial world loves to say, “past performance is not an indication of future returns”. IQ is not an indicator of success as various studies estimate IQ accounts as little as 4% to 10% to someone’s professional success. Robust human capital quantitative results are not measures of IQ. An IQ score can neither infer job success nor be a proxy for risk mitigation. Research in over 200 organizations worldwide revealed the difference between top performers to average performers finds only 33% of the performance is attributable to cognitive (IQ) and technical ability and 66% to human capital competency. Competencies are considered a behavioral approach to cognitive, emotional, and social intelligence. Studies on complex jobs reveal a top performer, someone rating highly in emotional and social competency, is almost 127% more productive than an average performer. 127% more productivity is a difference to product launch or product failure. How can you have an accurate measure of risk without an accurate measure of behavioral competency. Why would, or should, someone trust investing their money in any valuation that can not accurately assess competency or motivation as so much of the risk comes down to a bet on a leader and a team to deliver? Most private equity firms spend 51% to 75% of their time actively managing their portfolio companies and 68% say they are spending even more time with them than they did the prior year. The relationships between the investee and investment are human capital relationships. Even with this partner investment to coach and cultivate their portfolio 50% to 95% of private equity portfolios do not meet investment expectation. Again, there is disproportionate risk left undefined even as millions upon millions of dollars gets invested blindly. As this table shows, human capital risk is present across the investment life cycle. A more accurate human capital assessment provides business advantages in: higher returns, lower operating costs, and ability to redirect leadership, from the investment firm as well as the operational firm. But imagine a partner spending more time evaluating new deals or raising new funds than on operational stewardship. An accurate human capital risk assessment makes your firm more profitable and competitively attractive to both the investor and the potential portfolio companies. Conversely if you are trying to attract investors isn’t it in your best interest to understand their human capital capability before taking their investment? You should be vetting their capability to impart their wisdom, their network, and their resources. This presentation offers a more detailed view to identify and manage human capital risk. A competency is deﬁned as a capability or ability (Boyatzis, 1982, 2008; McClelland, 1973, 1985). It is a set of related but different sets of behavior organized around an underlying construct called the “intent”. The behaviors are alternate manifestations of the intent, as appropriate in various situations or times.